Hey gang...Travis back with more great Tampa Bay entertainment options, and this one is REALLY cool. The all-new Nuclear Cowboyz Freestyle Motocross tour is coming to the St. Pete Times Forum on February 19 and 20...FOR THE FIRST TIME EVER!!!!! The Nuclear Cowboyz tour has assembled the world’s greatest cast of freestyle motocross riders, including legends like Adam Jones, Mike Mason, Nate Adams, Jeremy “Twitch” Stenberg, and Ronnie Faisst who will synchronize awe-inspiring tricks while attempting to break world records. The entire 2-hour, heart-pounding scripted performance takes place within an intense set made to look like an urban post-apocalyptic scene, with lasers, lights, and incredible pyrotechnics. This never before seen freestyle motocross will also feature a wide range of added extreme entertainment exclusives like the Nuclear Cowgirlz dancers and exotic acrobatic fire presentations. 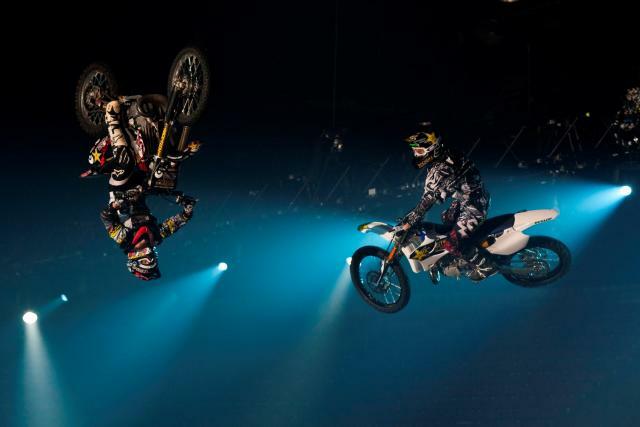 You may have seen freestyle motocross before, but you have never seen freestyle motocross like this! Show Times are Friday, February 19 and Saturday, February 20 at 7:30 p.m. Ticket Prices are $20 (upper level), $40 (mid level), $50 (lower level). and get them early because tickets are an additional $2 if purchased day of show. You can get tickets at any Ticketmaster outlet or by calling 800-745-3000. So get on the horn and order them now! See you back here for more Tampa Bay area events and awesome things to do in Tampa Bay.